January 27, 2019 By Eugene Nielsen & filed under All Articles, Other Tactics & Training, Tactics/Training. Speed is essential in any dynamic entry. Breaching must be both rapid and effective. A variety of methods—mechanical, thermal, explosive, and ballistic—may be employed depending on what is to be breached and the tactical situation. 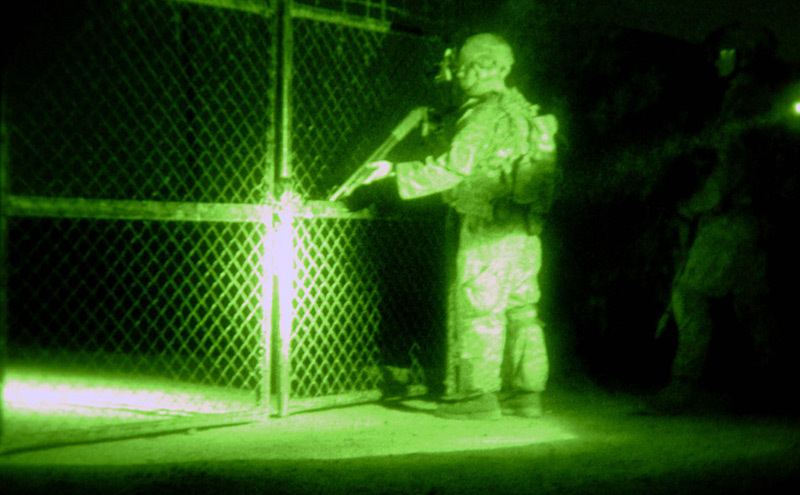 From a military perspective, since combat has migrated toward military operations in urban terrain (MOUT), ballistic-breaching operations have increased. Ballistic breaching with a shotgun offers a number of advantages over other breaching methods. Although entries may be made through windows, skylights, or explosively breached openings, the most common means of entry into a structure is through a door. Although law enforcement teams usually make the initial breach with a ram, ballistic breaching with a shotgun has its advantages. It is quicker than manual breaching, jamb spreading, or ramming, and it requires less training than thermal and explosive entry. Properly employed, a shotgun can provide teams with safer and faster door breaching than other methods, and it is not limited to doors. Shotgun breaching can also be employed to breach iron-barred windows, take out sliding glass doors, and defeat padlocks. A compact pistol-gripped (or Raptor®-gripped) 12-gauge shotgun makes the best breaching shotgun. Shotguns equipped with a fixed buttstock or that have a too-long barrel are unwieldy and more difficult to employ in many breaching operations. Magazine capacity is an important consideration, as multiple breaches/shots may be required. Another factor to consider is the ability to manipulate the safety with the strong hand without changing grip. There are pros and cons to pump shotguns versus semiauto shotguns. 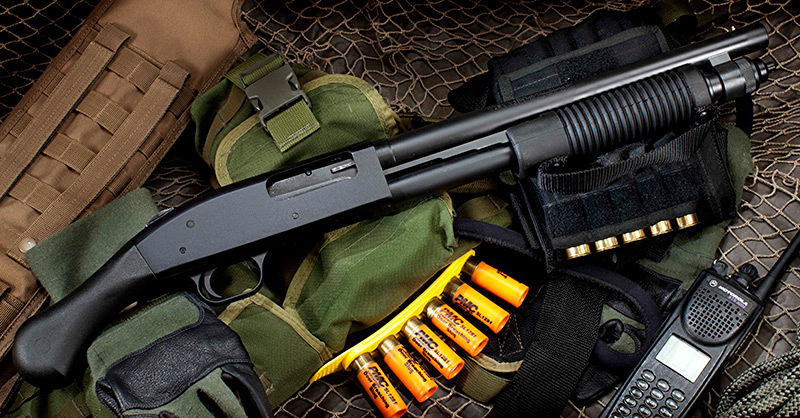 Pump shotguns provide greater versatility and are more widely utilized. The downside is that pumps don’t permit the rapid double taps of a semiauto shotgun when second shots are necessary. Rapidly breaching a door requires the capability to quickly fire multiple shots. Breaching shotguns need to have a cylinder bore to allow all slugs to be fired safely. 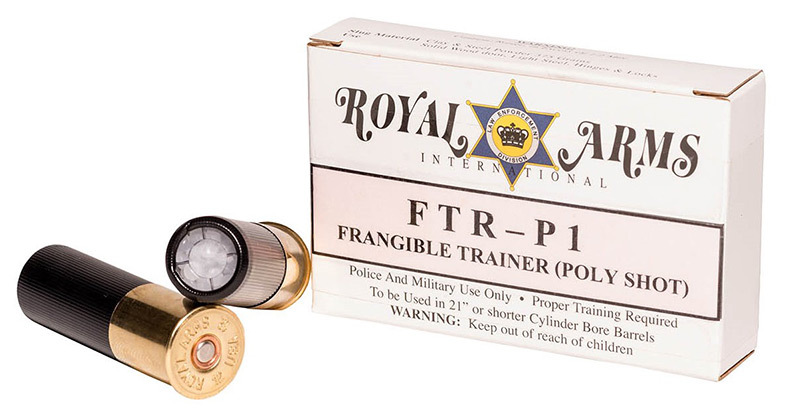 Although some frangible rounds may be safely fired in a shotgun with up to a modified choke, this is not the case with frangibles from every manufacturer. 12-gauge Mossberg 590 Shockwave is non-NFA alternative to short-barrel breaching shotguns. Though not considered a shotgun under Federal law, state and local laws may vary. Short-barrel 12-gauge “firearms” as exemplified by the Mossberg® 590 Shockwave® and Remington® Model 870 TAC-14™ are excellent non-NFA alternatives to a short-barrel shotgun for breaching. The Mossberg and the Remington are available in both tubular magazine and detachable box magazine models. When breaching, a minimum safe stand-off distance must be maintained before firing the shotgun. It cannot be placed directly against the door. A number of muzzle stand-offs on the market allow proper stand-off to be maintained, for example the outstanding Original Breacher® Breaching Stand Off Device from Royal Arms International. Advantages to employing a stand-off include: The stand-off provides increased speed and placement by allowing the shotgun to be fired with the stand-off in direct contact with the jamb or door. They permit safe contact by venting muzzle gasses. 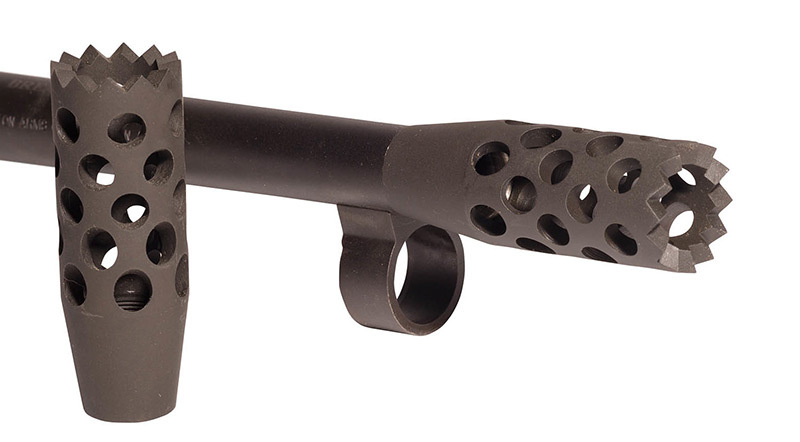 The better stand-offs also reduce recoil and eliminate muzzle jump and deflect debris. The shotgun remains effective as a weapon with the stand-off attached and can still be fired with all standard general-purpose ammunition. Makeshift stand-offs should not be used because they generally work poorly and often pose a safety hazard. Shotgun breaching should always be done with a dedicated breaching shotgun. Having a shotgun-armed operator carrying breaching rounds in addition to traditional slug or buckshot rounds is a disaster waiting to happen. The use of a harness system or breacher shotgun scabbard allows the operator to be armed with a long gun or other weapon platform in addition to the breaching shotgun. He can easily transition from the breaching shotgun to the primary weapon after a successful breach. Standard rounds should never be employed for breaching. Although standard rounds could be employed to defeat a door mechanism, they pose an extreme safety hazard. During MOUT breaching operations, Soldiers have suffered severe injuries using 00 buckshot cartridges that are not designed for breaching. Not only are friendlies at risk from ricochet, but standard rounds also pose an extreme safety hazard to those on the other side. In 2008, the U.S. Army approved a new 12-gauge frangible breaching round, the M1030 for use by Soldiers. It is now used for defeating wooden doors, deadbolts, knobs, hinges, and padlock hasps. Frangible breaching rounds are designed to disintegrate into a fine powder as they defeat the door mechanisms or padlock hasps, minimizing potential ricochet hazards or injury to those on the other side of the door. The first use of frangible rounds is credited to the late Detective Arleigh McCree, Officer in Charge of the Firearms and Explosives Unit of the Los Angeles Police Department. Det. McCree and Officer Ronald Ball were tragically killed on February 8, 1986 while attempting to defuse two booby-trapped pipe bombs. The frangible slugs developed by Det. McCree were made from steel shot and dental ceramic powder. He also coined the term “Avon.” Frangible rounds designed specifically for breaching are now available commercially from a number of manufacturers. Tests have shown that the greatest transfer of energy and efficiency in slug frangibility results from high slug velocities achieved with medium CUP gas pressures. This is best achieved by utilizing a full-length plastic hull shell with an extra-high brass, along with a gas check. It is essential for safety that frangible slugs completely disintegrate during breaching and not refuse into larger particles as a result of the heat generated. I recommend using frangibles constructed of either compressed copper or clay and extremely fine steel shot. These materials eliminate the possibility of refusing, something that can occur with frangible slugs that are constructed of compressed zinc or glued lead shot. One source is Royal Arms International, which offers a wide range of compressed copper and clay/steel frangible 12-gauge breaching rounds, along with other specialized breaching rounds, including low-cost Frangible Shotgun Breaching Training Ammo. Royal Arms TESAR (Tactical Entry Safe Avon Rounds) and TESCR (Tactical Entry Safe Clayvon Rounds) are currently in use by numerous local, state, and federal agencies. All are 2¾-inch shells and have color-coded caps for easy identification. Sales are restricted by Royal Arms to law enforcement, military, and government. All Royal Arms products are made in the USA. Four different TESAR frangibles and one TESCR frangible are available from Royal Arms: the TESAR-1, TESAR-2, TESAR-4, TESAR-5, and TESCR#3. TESAR-1 (orange color-coded cap) has a 275-grain copper frangible slug and a velocity of 1,750 feet-per-second (fps). [Note: All velocities listed here are from an 18-inch barrel.] It is designed for wood doors (solid and hollow core) and defeats common locks, cross bolts, and hinges. TESAR-2 (black color-coded cap) has a 425-grain copper frangible slug and a velocity of 1,525 fps. It is designed for metal doors and heavy locks and hinges, eliminating the need for multiple shots. 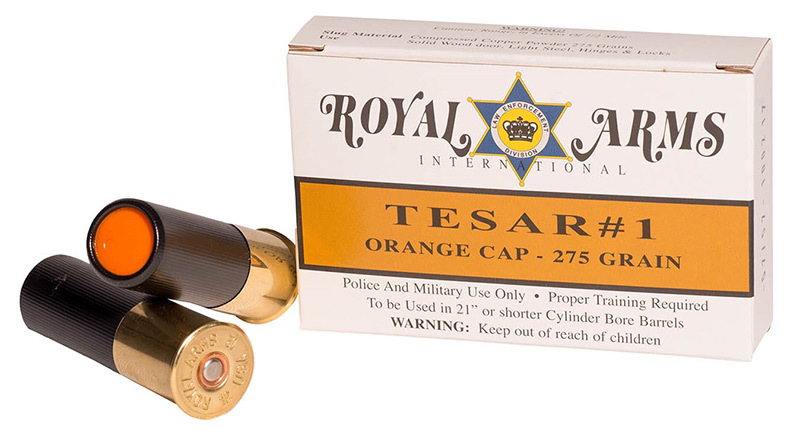 TESAR-4 (yellow color-coded cap) has a 750-grain copper/S-70 steel frangible slug and a velocity of 1,285 fps. It is designed for Class 3 heavy steel doors and defeats Class 3 doors, locks, and hinges. TESAR-5 (blue color-coded cap) has a 500-grain copper frangible slug and a velocity of 1,450 fps. It is designed for metal doors, locks, and hinges and defeats heavy locks, cross-bolts, and hinges (steel doors/steel frames). 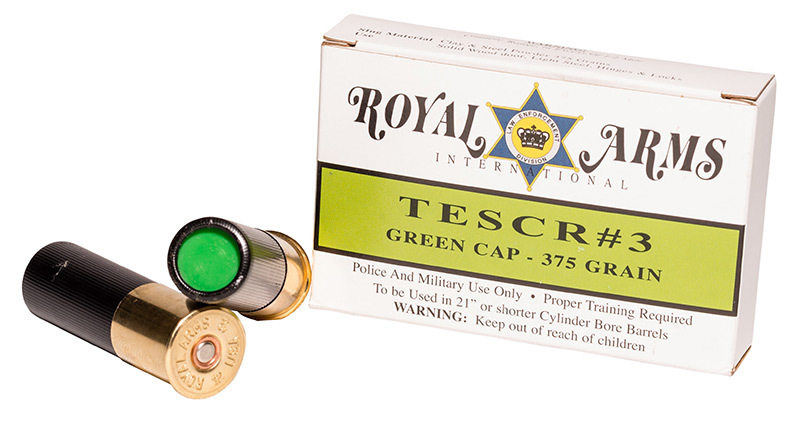 TESCR#3 (green color-coded cap) has a 365-grain Clayvon® (clay with S-70 steel shot) frangible slug and a velocity of 1,650 fps. It is designed to defeat most doors (from hollow core to light steel), locks, and hinges. TESCR frangibles produce a bigger hole with a reduced risk of overpenetration. Of the five Royal Arms frangibles, the TESCR#3 is my choice if an agency wants to limit the types of rounds in its inventory. Having a single round that can be used on most commonly encountered wood and steel doors has definite advantages. TESAR frangibles are unique in their high degree of accuracy. They remain accurate out to 90 yards. They do not ricochet. They may also be utilized taking out street lights and attacking dogs with little fear of overpenetration. TESAR and TESCR frangibles can also be successfully employed to defeat iron security bars common on many windows, and to effect entry through sliding glass doors. Barred windows may be defeated by shooting out the 3/8-inch iron bolts (top and bottom) on one side and then using leverage to peel back the bars. Sliding doors may be taken out by shooting at the bottom corner of the door, one inch above the frame. The glass will then come straight down or “shovel” out a maximum of five feet on either side. The glass will not implode or explode. Breaching a door with the fewest number of rounds possible is faster and reduces the chance of collateral damage. The latch and lock are the easiest to target and require fewer rounds to breach. Attacking the hinges requires more rounds fired, and the hinges may be hidden from the outside. When breaching a door, the frangible rounds to the lock side are fired at a point halfway between the lock or handle and the door frame in order to hit the bolt holding the door shut. In situations where a hinge must be breached, MOUT doctrine calls for a total of three shots, one shot per hinge, followed by an attempt to open the door. Frangible rounds should be fired into the jamb/door or window bar bolt at a 45-degree angle and 45 down or up. 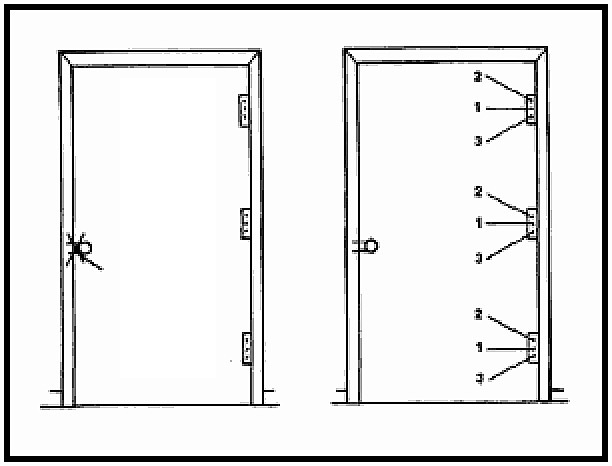 The exception to the 45-degree angles is when breaching a steel door, since employing the 45 by 45-degree angles could cause the steel to buckle and lock. When breaching a steel door, the shot should be 90 degrees into the door and 20 degrees down or up. Shots should be fired at a downward angle if the shot is at chest height or lower and at an upward angle if above chest height. The reason for this is to lessen the possibility of a person being struck by a projectile or debris. Make no mistake: Frangible rounds can be lethal. Although not designed with defense in mind, frangible rounds can double as antipersonnel slug rounds should the situation warrant. They are extremely effective against unprotected targets because of their frangible nature. Royal Arms TESAR and TESCR#3 frangibles work well in this role. Although the TESCR#3 doesn’t have anywhere near the accuracy of the TESAR frangibles, it works well as a close-range defensive round. 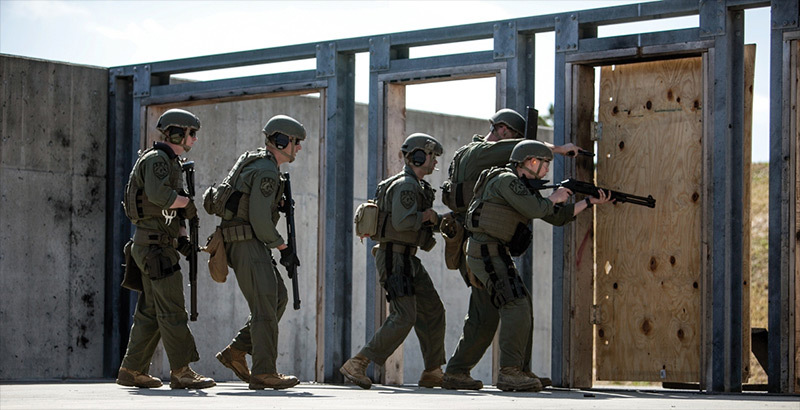 Breaching doors are available that allow for low-cost training and practice. 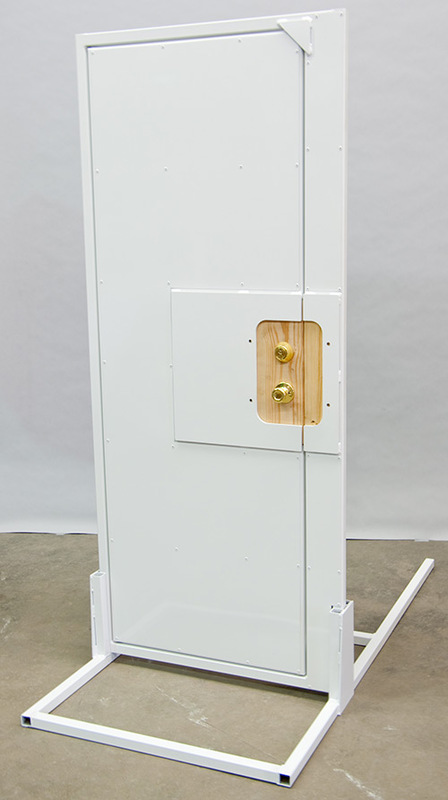 The Breach Door from MGM Targets lets you breach mechanically, thermally, ballistically, and some limited explosive breaching. All this can be accomplished quickly with standard 2×4 and 2×8 wooden blocks. The design allows it be quickly set up with conventional locks, chains rebar, or simple wood screws. This article is a brief overview of ballistic breaching with a shotgun. It is not intended as, nor is it a substitute for, formal training by a qualified instructor. Training is available from Royal Arms, which also offers door breaching stand-offs, barrels with stand-offs installed, and custom breaching shotguns.